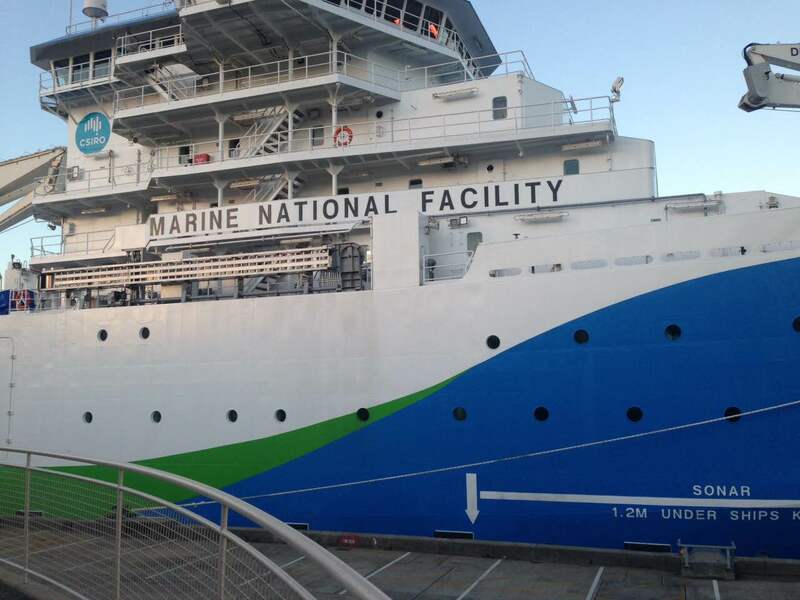 Some of my fellow ‘spies’ have just sent me a photo from Hobart… the Investigator, the new CSIRO’s purpose-built research vessel, resting at her mother port! This photo took me to the times at sea I was lucky to enjoy, onboard the now decommissioned (?) vessel, the Southern Surveyor. The first time we sailed all the way from Brisbane to Fiji. Lead by Dr. Robin Beaman (JCU), we mapped the southern-most tip of the Great Barrier Reef, offshore that marvellous natural site that is Fraser Island. These results will hopefully help unveil the processes behind the birth and demise of coral reefs through geological times. The second time the trip was longer… we sailed all the way from Broome, WA to Brisbane, QLD passing through Torres Strait. We mapped the ancient reefs of the Great Barrier Reef, those that are now found at depths of at least tens of meters below the water surface. These are very difficult to map, indeed. Many times, especially in the northern Queensland waters, the 200 ft boat had to get very -too- close to the reef under unfavourable swell, which was only possible with great weather (and a nice Captain!). Besides the mapping and the seismic imaging of the seabed, there was a great deal of other science projects on the most varied subjects happening in these trips: plankton, ocean currents, surveying turtle populations, carbon budgets, plastic debris, air quality… all in a unique atmosphere of collaboration between scientists, crew, Captains, engineers from many universities and government institutions. Many of us at the Geocoastal Group had the opportunity to do world-class research onboard the Southern Surveyor and now a whole new chapter opens with the new vessel. Can’t wait to listen to the many stories and projects to come!